We supply high-performance ITG foam air filters to suit our range of Carbon Fibre air boxes including the Reverie Hockenheim 4 cylinder, V6 and V8 air boxes and Interlagos 4 cylinder air boxes. All of our ITG foam air filters are supplied with fixings and are specially designed to fit our airboxes directly with no modifications. 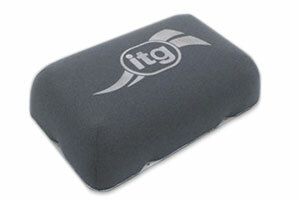 Below, technical information can be found on our ITG air filters as well as links to purchase. 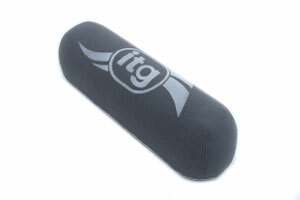 ITG Foam Air filter. Fits Reverie Zolder 112 & 150 air boxes. Air filter can be used on engines up to 290bhp. Includes fixings. 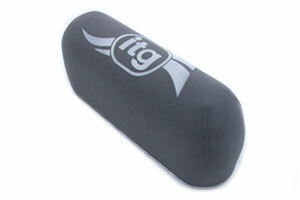 ITG Foam Air filter. Fits Reverie Hockenheim 422 & Interlagos 425 air boxes. Lightweight air filter less than 1kg. Includes fixings. 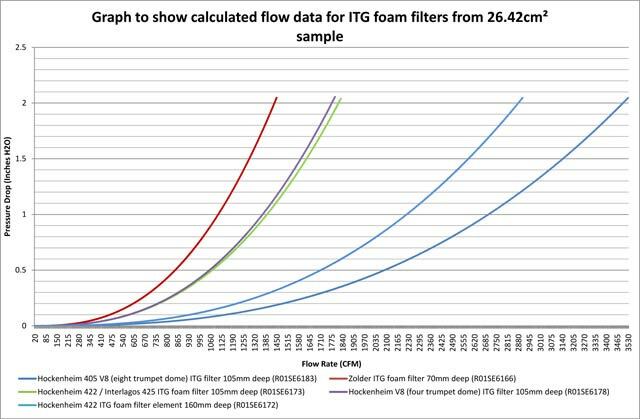 ITG Foam Air filter, increased height at 160mm with larger surface area. Fits Reverie Hockenheim 422 air boxes. Includes 4 bolt fixings. ITG (double 8 trumpet) Foam Air Filter. Fits Reverie Hockenheim 405 V8 air boxes only. Includes fixings. An inlet that is too small will cause a pressure drop inside the air box restricting performance. The inlet sizing guide (below) shows the minimum recommended inlet and ducting size for a power output category. The larger the power output of an engine the more air it will require to run at peak efficiency, therefore a larger inlet pipe/duct is needed as power increases. Multiple smaller inlet pipes/ducts can be used to achieve the same open area as a larger inlet, for example, if a larger inlet pipe/duct won’t fit on the air box, multiple smaller pipes or oval inlet pipes could be used to create a comparable open area. High flow alloy straight trumpets can also be used as intakes. The formula below shows the formula for required airflow to the engine in cubic feet per minute.